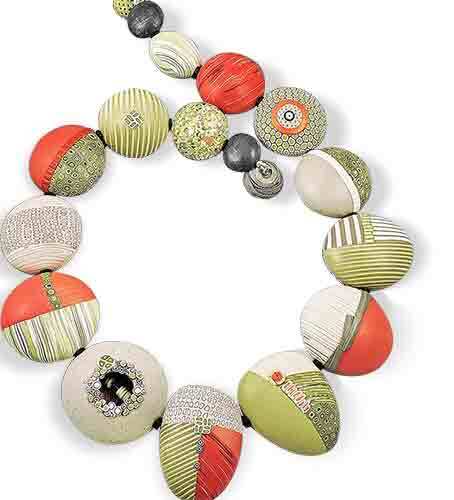 A number of woven polymer beads have popped up online. 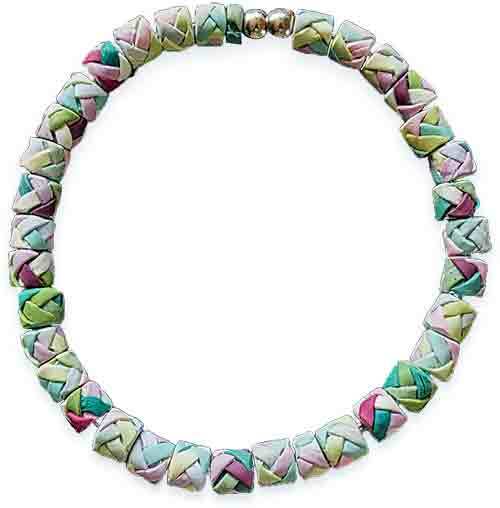 Eliska Koliosova weaves extruded strips in this light summery choker. She alternates the colors under and over each other, perhaps creating a flat sheet that’s then cut up and rolled into a bead. Or maybe Eliska is using the Mummy Bead technique that Emma Ralph outlines on her site. She starts by winding a base color on a wooden skewer and then layering on additional colors. My brain doesn’t decode weaving very readily so rather than ponder this any longer, I’ll show you and hope that some enterprising PCD reader can unravel the mystery. Whatever the method, the effect is eye-catching. Thanks to Carrie Harvey for leading me to Emma’s tutorial. 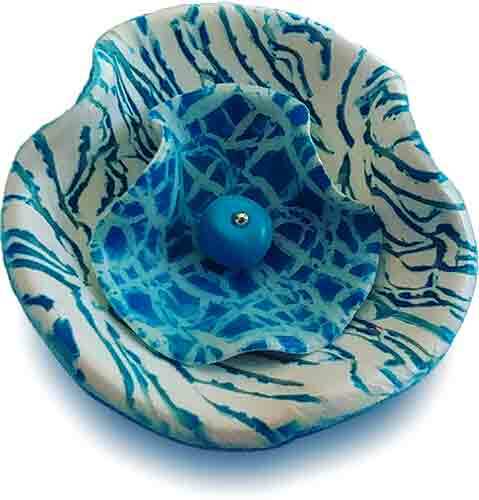 Spain’s Cristina Garcia Alvarez (espiralarte) helps us remember to enjoy the last flowers of summer this weekend with her layered polymer bloom. 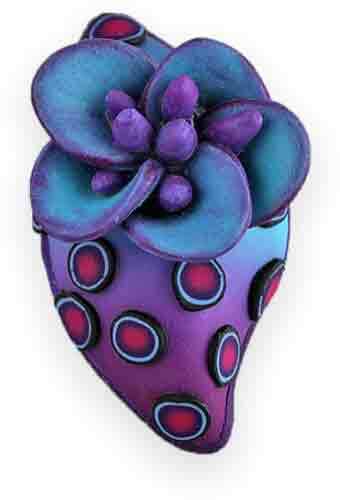 It’s a simple brooch made in watery blues that recur frequently in her work. Look at her Instagram and you’ll see samples of any number of techniques. The striking blues jump out as a recurring theme. Look over your work and see what colors jump out or make your heart sing. The file of tidbits for this weekend’s newsletter is bursting with juicy tips and stories we don’t have time for during the week. Join us on StudioMojo for the low down. I’m off to write! 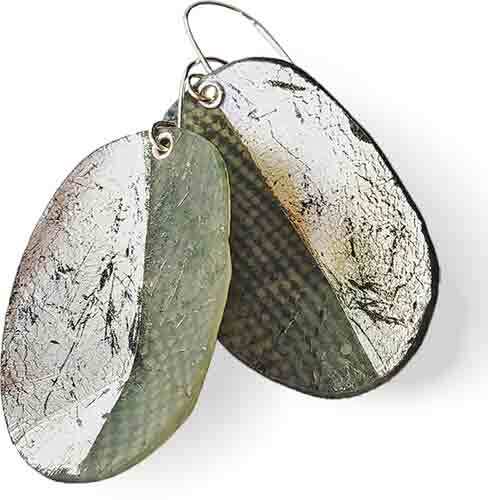 Seattle’s Sarah Wilbanks distresses her translucent slices and turns thin concave polymer ovals into fashionable urban grunge earrings. They’re sold at the Seattle Art Museum in combination with the Yaoki Kusama exhibit which is full of color and repeated patterns. Translucent polymer lured Sarah back to polymer and she’s developed several variations of carved shapes that are both graphic and primitive in their appeal. You’ll find her work on Instagram, Etsy, and Facebook. The spiky red petals on this polymer and silver Saxifraga become dramatic post earrings from France’s Celine Charuau (GrisBleu). 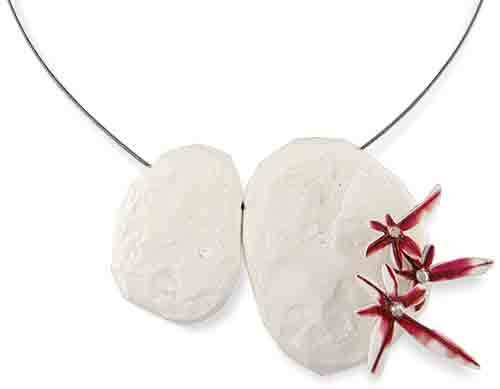 She continues her garden interpretation with a few more blossoms protruding from two flat white polymer disks that she joins as a pendant. Celine includes Octotilla, Erythrina, Snow Flowers and other unusual species in this year’s garden of mixed media jewels on Flickr. How does your garden grow? Lynn Yuhr (theFlyingSquirrelStudio) went off on a tangent and developed a new line of spontaneous jewelry. This lovely gradient topped with succulent petals Lynn named Hazel. Read about how Lynn decided to nurture her tangents and follow wherever they led. Do you allow yourself to go off on a tangent from time to time? There’s nothing juicier than a step-by-step from Loretta Lam to kick off the week. First, the sketchbook magic pulls us in. Then the jumble of companion canes brings color into the equation. “I spend a lot of time on the palette. I know the feelings that I want to convey and it has to be just right. In this case – fresh, vibrant and youthful but still sophisticated,” says Loretta. The naked bead forms seem dark before she brightens them with slices of patterns. If you go to her Facebook page, you’ll find a slideshow in which she arranges and completes the necklace plus lots more pictures to encourage you to trot off to your workspace. Loretta will be teaching her Designing with Distinction methods in Durfort, France in October and in Monza, Italy in September.